We can never insure one hundred percent of the population against one hundred percent of the hazards and vicissitudes of life, but we have tried to frame a law which will give some measure of protection to the average citizen and to his family ..."
During the Great Depression of the 1930s, unemployment devastated the lives of individuals and undercut the nation's economy. Older Americans as a group were particularly affected by this economic crisis. Improvements in medicine and public health meant people were living longer, yet many elderly Americans faced age discrimination that made it difficult to find employment. As a result, the Social Security Act (SSA) was enacted on August 14, 1935 to help older Americans deal with this problem. This lesson engages students in the debate over Social Security that engrossed the nation during the 1930s. Students will be given the opportunity to examine the 1935 Social Security Act, and to read, listen, and watch the debates surrounding the development of this important legislation. The activities in this lesson have students use primary source documents to develop their own points for a debate. In addition, analysis of visual, audio, and video sources will enable the students to evaluate the reasons for the creation of this act and related agency. How did the passage of the 1935 Social Security Act transform the role the federal government plays in the lives of the American people? Upon completion of this lesson, students should be able to: describe the reasoning of the Roosevelt Administration in creating this act. Assess the arguments that were made to support or oppose the act. Understand and analyze the ways in which the Social Security Act changed the role of the federal government in relation to the nation's workforce. Examine the way the Social Security Act reflected divisions in American society. On August 14, 1935, the Social Security Act (originally called the "Economic Security Bill") was enacted by the 74th Congress to give older Americans a pension that would ensure a reasonable standard of living as they aged. In addition, the Social Security Act provided unemployment insurance for workers, aid to needy children who had lost one or both parents, and disability insurance for workers who could not work on account of an injury. Franklin Roosevelt had established old age pensions for the State of New York when he served as governor. By the time of his presidency, controversial figures such as Huey Long, Frances Townsend and many others had publicized their own plans for remedying the economic crisis and the plight of the impoverished elderly. The President set up a Committee on Economic Security to study the problem and make recommendations. In the United States, direct federal or state pensions for the poor had a limited history. In Europe, however, there was a long tradition of government action to provide for citizens' economic security. The Social Security Act was politically moderate. It was to be funded by both employees and their employers, instead of redistributing general tax money. Still, it represented a milestone in moving this country toward a modern welfare state; as a result of this legislation, the United States joined other industrialized nations in offering old-age pensions and unemployment compensation. The move, however, met a great deal of resistance from a variety of constituencies. The links below contain a broad range of perspectives that should help provide background on the issues relating to the Social Security Act. The way the Social Security Act may have reflected and reinforced inequalities in American society. The Social Security Online website, a link on the EDSITEment-reviewed History Matters site, is a rich resource. Its overview of the evolution of economic security in the United States explains the political context and early workings of the Act; especially pertinent is the section on the 1930s, beginning with "The Stock Market Crash and the Great Depression" and continuing up to "1939 Amendments." The site also gives the actual text of the Social Security Act of 1935, an extensive record of its legislative history, and provides information on the legal background of the Social Security Act. (The legislative history is particularly useful for teachers who will do the Extending the Lesson activities with their classes.) Finally, the site presents a government booklet published in 1937; it gives the administration's perspective on the Social Security Act as a necessary adaptation to an industrial economy. The EDSITEment-reviewed America's Library site created by the Library of Congress provides a brief Great Depression time line that gives examples of the effects of the stock market crash in 1929. A succinct three-paragraph background on the origins and impact of the Social Security Act from the Franklin D. Roosevelt Presidential Library is linked from the EDSITEment-reviewed American President.org. This site also presents the statement Roosevelt made upon signing the bill into law on August 14, 1935. Digital History, an EDSITEment-reviewed website, offers a brief overview of the actual workings of Social Security legislation once it passed, and discusses those groups excluded from its protection. The site also offers a good summary of African Americans and the New Deal. Social Security Act: Images from the FDR Library provides posters and photos which can help understand the context and the campaign behind the passage of Social Security. Students will analyze three of these posters in Activity 2. Students can access the primary source materials and some of the activity materials via the EDSITEment Study Activities and worksheets which are listed under "Additional Student/Teacher Resources" in the left sidebar. This activity is available as a series of LaunchPads divided by group. Step One: Have the students review the Great Depression time line and the section entitled "The Stock Market Crash and The Great Depression" on The Historical Background and Development of Social Security page, and ask them how the Great Depression may have affected the lives of working class Americans. From this starting point, ask the students to think about how the Great Depression may have affected older workers differently from younger workers. Using this discussion, have your students read the Preamble to the Social Security Act. How was the Social Security Act going to provide for Americans in a different way than they had previously been provided for? Why do you believe the Social Security Act identified these particular groups in its preamble? According to the preamble, what problem is the Social Security Act solving? Under this system, what does the federal government do and what do the states do? Why divide their duties in this way? Step Two: Students will use four primary source documents to learn about the debate over the Social Security Act that took place from 1935-1937. This activity will introduce students to key arguments supporting and opposing the establishment of Social Security; students will then build on this knowledge in Activities Two and Three. Explain the speaker's reasoning, paying particular attention to whether their position is based on evidence, logic, or economic and political ideology. Do you agree or disagree with the author of your document? Why or why not? Do you think contemporaries would have found his or her arguments convincing? Why or Why not? President's Message to Congress, January 17, 1935, New Deal Network excerpts available on pages 1-2 of the PDF. If they go to the website for this reading, students should read paragraphs 3 through 7, and paragraph 9. George B. Chandler, representing the Ohio Chamber of Commerce, in Senate Hearings on Roosevelt's "Economic Security Bill," 1935 excerpts available on page 3 of the PDF. Alfred M. Landon, "I Will Not Promise the Moon," September 26, 1936 excerpts available on pages 4-5 of the PDF . Step Three: After each group has completed their task, ask the students to discuss their answers to the four questions given above and distributed with each of the handouts. As a class, create a T-Chart to evaluate the reasons why people were either for or against this act. Conclude this activity by asking students to decide which of the positions, taken in the context of the times, was strongest and why. T-Chart is available here. This activity is available as a Study Activity. Step One: Students are to access the Social Security Act posters listed below to identify the ways in which the federal government was trying to build support for the Social Security Act among the American public. Why do you think this poster was created for the Social Security Act? Who is portrayed in the poster? Which Americans are NOT portrayed in the posters? Why might they be missing from these images? In order to "sell" the Social Security Act to the nation, why do you believe the Roosevelt administration chose these images? Identify the ways in which the federal government attempted to "sell" the Social Security Act to the American people. Explain, using annotations to the actual image, the reasons for your answers. How else could the federal government have "sold" the Social Security Act? After completing steps one and two above in this activity, have the students review the posters above and the training mid-wives photo from this time period (though not related to the selling of the Social Security Act). Once students have looked at these four photos, the students should be encouraged to discuss the ways in which concepts about race and gender were used (or not used) to help sell the Social Security Act. Students annotate the training mid-wives photo as they annotated the Social Security images in Step Two. 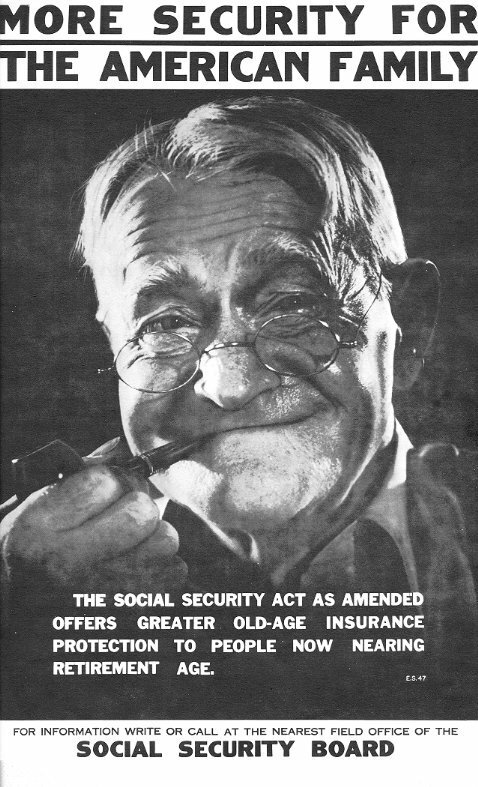 Who are the people represented in the Social Security Act posters? Why do you think these images or people were chosen for Social Security Act posters? How does the training mid-wives photo portray groups not included in the Social Security Act posters? Do these posters for the Social Security Act indicate any signs of gender or race bias? If so, why do you think that is? Step One: Have students read Digital History's short overviews of Social Security and African Americans and the New Deal. Digital History is an EDSITEment-reviewed website. Step Two: Access America's Town Meeting of the Air, "Should We Plan for Social Security?" of December 19, 1935 for the debate on the SSA, and download each speech by Francis Perkins and George Sokolsky as outlined in Preparing to Teach the Lesson. Transcripts of their statements are available in a separate PDF. Suggestion: you may have to listen to these recordings more than once for the full meaning. Why did Francis Perkins think that the Social Security Act was a good program? How did Francis Perkins describe the role of the states and federal government in administering this program? How did the audience respond to Francis Perkins' statements? Why do you think they responded in that way? If you were listening to this speech as an audience member how would you have responded? How does George Sokolsky criticize the Social Security Act? How did George Sokolsky describe the role of the states and federal government in administering this program? How did the audience respond to George Sokolsky's statements? Why do you think they responded in that way? If you were listening to this speech as an audience member how would you have responded? Step Five: The Town Meeting of the Air was a live radio discussion on an important topic of the day. Students will take the role of audience members and continue the discussion. Students should use their notes from Activities One and Two, as well as the radio debate in this activity. The teacher should, in advance, assign some students to roles such as business leaders opposing Social Security, New Deal officials supporting it, some members of state government who might have a comment on the state role, small business owners, workers, women, and African-Americans who might have a variety of perspectives on social security. Specifically, as the students prepare their roles, they should explore and identify how their person would most likely think about the Social Security Act (i.e., how would it impact their life; how would a farmer, factory worker, small business owner, woman, African American, etc. look at the Social Security Act from his/her point of view). The teacher should take the role of the host of the program, moderating the discussion. Extended Time Option: If you have more time available to conduct this activity, it may be useful to have students listen to more of "Should We Plan for Social Security?" on America's Town Meeting of the Air. By listening to the longer segments of Perkins' and Sokolsky's arguments your students may be able to better identify the role the audience may have played in this debate, as well as what audience reaction might tell us about attitudes concerning Social Security at that time. For example, Mr. Sokolsky's speech received a much warmer response than Francis Perkins' did. What might this reaction imply? Since this activity has your students playing the role of the audience, finding the time to listen to each speech in full may increase your students' understanding of the debate surrounding this topic. Have your students create their own Social Security Act advertisements that either support or oppose the SSA. In groups of three to five, students can create a poster or radio advertisement that incorporates audio and visual elements to support their point of view. They may use material from this lesson in their advertisement, for example, adapting one of the poster images with their own text, or using text from one of the documents they've read. Students will present their advertisement to the class, and then explain their point of view on this topic in detail. With each presentation, have the class evaluate the persuasive power of the presenters' argument. In order to evaluate each group's presentation, the class, as a whole, should develop the criteria for evaluating these presentations. If you wish, you can ask each student to write an explanation of why and how the images and words they've used support their position for or against the Social Security Act, relating concrete details in their advertisement to their beliefs. Students will create an editorial page as if they were writing at the time of the passage of the SSA, in which they predict the successes and problems that this new legislation will face. They are to explain clearly why they are making their predictions, while at the same time they are evaluating the SSA. FDR's Speech at the signing of the Social Security Act, 1935, Video Clip. (Go to Social Security Online: Sights and Sounds, scroll down to section 2: FDR's Speech). Using the link above, ask your students to outline the reasons why FDR believed this act was necessary. They should focus on the ideas, beliefs, and factual information that Roosevelt presented to support the SSA. Students will then use their outline to draft a press statement which will clearly identify the benefits of this act and also refute opponents' complaints or reservations, as presented Activities One and Three in this lesson. With this activity, it is suggested that students use found or self-created images and charts to reinforce their statement to convince their audience of the importance of this new measure. From its passage in 1935 the Social Security Act highlighted many important debates throughout American society. The gender issue is one such debate that was raised by the SSA. This activity introduces students to the fact that women and men were treated differently in the allocation of Social Security benefits. With this activity, students will be presented with different parts of the opinion of Justice Brennan in the Supreme Court case Califano v. Goldfarb, 430 U.S. 199 (1977). How did the SSA reflect gender prejudices of the 1930s? How were these assumptions being challenged in this 1976-7 case? Why were Social Security benefits for widowers and widows handled differently? How might men in 1935 have felt about this issue? How might women in 1935 have felt about this issue? What is the possible impact of the ruling Califano v. Goldfarb on men, women and families in the U.S.? Was this decision the correct ruling? Robert H. Jackson Center—"Jackson's Voice Clear on Social Security Issues"
Review the Great Depression time line and the section entitled “The Stock Market Crash and The Great Depression” on The Historical Background and Development of Social Security page, and answer the questions below.